Have you received a pamphlet and have some questions? Welcome! Clearly, it’s a free informational pamphlet. Why not? I have a strictly whim-based distribution system. Less evasively, I like to share the surprise. Printmakers like printmaking partly because it comes with a surprise inside; we spend lots of time making a plate, but we’re never quite sure how it’s going to look when we pull a print off of it, so when we do, bam, it’s a surprise. But people looking at the print later don’t get to have that experience, they just see a piece of paper. Anonymously mailing pamphlets to people is one way to spread the surprise around. I have a list of people I send these things to, which changes for each pamphlet. Some people are always on the list, some people are sometimes on the list, some people just get one copy. It changes. Usually they are people that I’ve met or worked with over the last year or so, but sometimes they are strangers, or almost-strangers. Up until recently, there were no subscriptions. If I wanted to send you a pamphlet, I did. Why does it look different from the rest of my mail? It’s printed letterpress, that’s why. 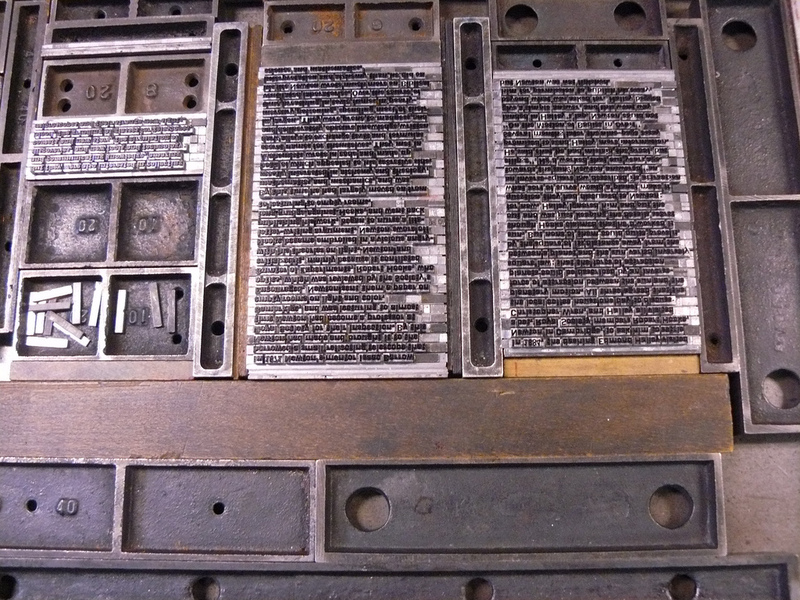 From genuine metal type and woodblocks. Also, the rest of your mail is just bills and credit card offers. So it’s way better than that. Letterpress was the primary way to print and distribute information from the mid-15th century up until the twentieth century. It’s a relief printing technique, using moveable type in the bed of a printing press. It was often combined with woodcuts or linoleum-cut images. Woodcuts are the earliest printmaking technique. There are more newfangled ways of using letterpress, but Brain Washing from Phone Towers Informational Pamphlets are made the old-timey, labor-intensive way, from metal type cast by Ed Rayher at Swamp Press. My name is Sarah Nicholls. I’m a Brooklyn-based printer and visual artist. You can see other kinds of things that I’ve made here.When not printing pamphlets, I’m working on a field guide to extinct birds. For twelve years I ran the studio programs at the Center for Book Arts in NYC. That’s where I print my pamphlets. Recently I left my job to pursue a brilliant career in independent publishing. Wish me luck. They’re short. They’re small and nimble. I can finish one in a month. Everyone knows what a pamphlet is. Brainwashing from Phone Towers? What’s that all about? Well, generally it has something to do with the distribution of information in a paranoid context. I’m really excited about the idea of a reading private right now. Reading printed material is one of the more private experiences you can have; it’s just you, the reading voice inside your head, and the story that it’s telling you. No one’s listening in, or tracking your data, or adding you to a database. Less generally, but more tangentially, it has to do with this seminar I had to go to. In my other life, as a Professional Arts Administrator, I often got sent to Professional Development Workshops, because funders don’t just want to give us free money, they want us to do something called Capacity Building, which in my case usually means sitting through an hour long presentation about Why Your Organization Needs to Use Twitter. The last one I had to go to stuck out for me because the presenter was this guy with a headset on, like a drive-thru window headset, and he just kept walking back and forth and back and forth on the stage really really quickly, and shouting at the top of his lungs about his smart phone and about his twitter feed and his social media fan base and on and on and on and he just kept on yelling about how we all needed to be doing this because this is the most important thing that we all have to be doing, because this is all that matters, because this is the future. And honestly, I have nothing against social media. I spend a lot of time with social media. Look at me, writing on the internet! But I have a great deal against being bullied into using social media. Also, you know all those studies on cell phones and brain cancer? The ones that say there’s not a link are all funded by the telecommunications industry. Just so you know. Why don’t you just blog? Why bother printing something at all? Don’t you know it’s the future? Because if I just blogged no one would read it. My mom’s the only person who reads my blog. And if you did accidentally stumble upon my blog for some reason, you’d get halfway through one post, then think to yourself, all of those words, all in a row, and then get distracted and go watch a cat video. If you send someone something in the mail, hand addressed to them, printed letterpress so it’s all nice and special, people read that. That’s the truth. And most of the people I send these pamphlets to later reach out and say, hey, thank you for sending me that pamphlet. That was nice. And so for a brief moment in time I get to live in a civilized society. I enjoy that, I really do. Wait, where’s your blog? Maybe I do want to read it, how do you know what I want to read? Here you go. Say hello to my mom for me. It’s mostly about extinct birds at the moment. What are you going to do when the post office goes under? Well, I’ve been researching my options. Pamphlet distribution via paragliding is on the list. Well, after some wrestling with it I’ve decided to try a subscription series for the pamphlets. I’d really like to continue doing them, but it doesn’t seem feasible to do them in the same way that I have been; I no longer have free studio access through my job, and fees there are going up. A year’s subscription to the series guarantees 3 pamphlets a year. Subscriptions help fund the entire project. I will still send out free pamphlets to my list, but if you’d like to guarantee that you receive all of them, and help support their production, please subscribe. IN ADDITION, all subscribers will be asked to nominate a friend to be added to the year’s pamphlet mailing list, as a surprise gift. Subscribers will be contacted individually for their nominations. I’ll need their mailing address. As of 2017, I have almost 50 subscribers, and most have also nominated a friend to the mailing list. 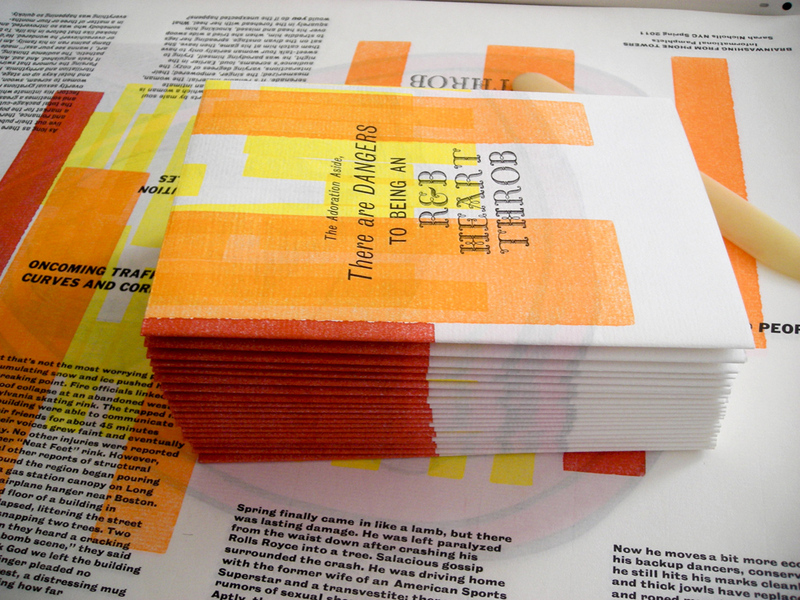 Editions of 200 usually go out to about 150 people, including subscribers and their friends. The remaining copies I keep to sell at fairs and for posterity. I would like to thank everyone who has bought a pamphlet for themselves or others for their support. Thank you!